One of the things I love about Brown Pelicans is their personality. They always seem to be aware of everything going on around them. As I photograph them in flight, they always seem to look right at me, checking me out to see what I’m up to. On the docks they often act like they own the place, not intimidated at all by humans. They are very curious birds. With curiosity can come trouble, if one isn’t schooled properly. 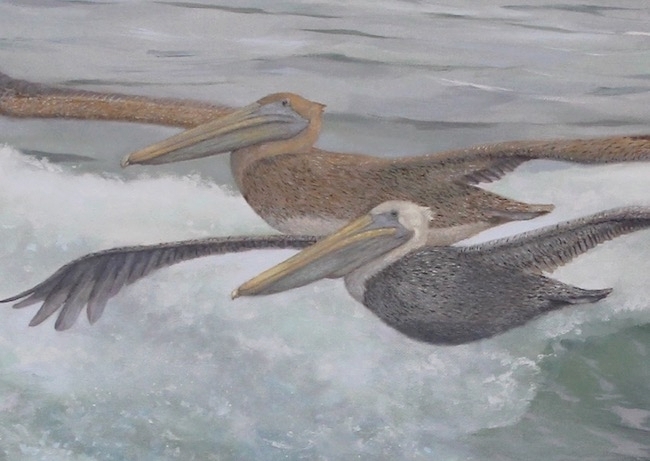 In my painting entitled The Mentor, I’ve depicted two Brown Pelicans flying low over breaking waves. They’ve ventured out on a gray day, not knowing if the weather will take a turn for the worse. In the lead is the mature adult (white head and grayish body), followed closely by the large juvenile (brownish). Whatever move the adult makes the juvenile follows. In either case, from this image my mind conjures up images of the mentor taking the juvenile to his favorite fishing spot, teaching him how to use his gular pouch in the most efficient way, and pointing out which fish are the tastiest. Another feeding lesson learned is to follow the fishing and shrimp boats into port, have patience, and go after the unwanted throwaways from the fishermen. Never go after a fisherman’s catch! Importantly, the mentor passes along flying tips, wind conditions, when to fly low and ride the waves, when to go high, how to dive from a certain height to best see the fish from above, and all about surf conditions. Brown Pelicans always captivate me. Seeing them glide so easily on windy days over rough surf fascinates me. My love of water and pelicans compelled me to paint The Mentor. I wanted to create a tonal piece using a limited palette. A combination of blues, browns, and whites were mixed to create the variety of gray tones. Limited use of Thalo green, Viridian green, and Yellow Ochre were added to create some translucency in the waves. A tad of Ivory black was added to some of the darkest colors. In the end, it was my desire to create action, while maintaining an overall calmness to the scene. Fortunately Brown Pelicans flying along the coast are now a common sight, after a number of years when their population was in decline.